One of the most beloved of all Japanese divinities, the MIZUKO JIZO Buddha takes care of and represents stillborn, miscarried and aborted foetuses. 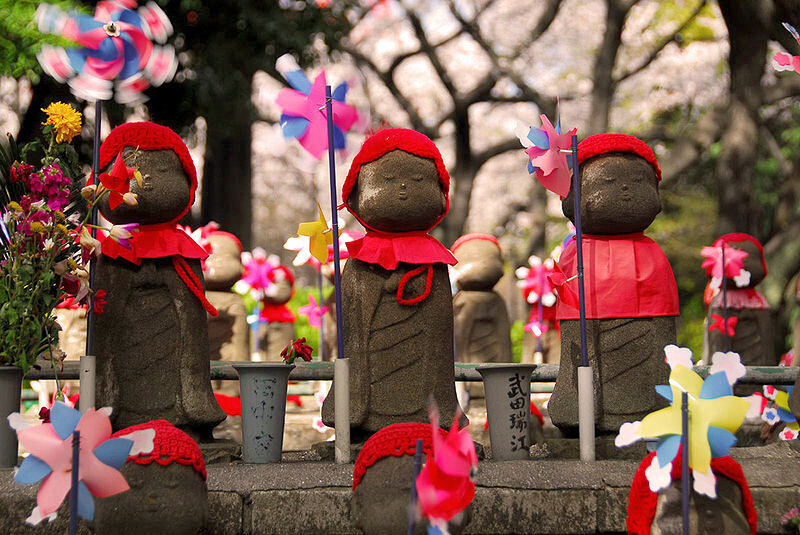 Unique to Japan, the ceremonies surrounding the jizo were created and developed by women. Over the centuries, the image of the mizuko jizo has changed, from a dignified, adult figure, to a serene looking monk-child with a Buddha smile. The jizo has a double purpose. The image both represents the soul of the deceased infant/foetus, and is also the deity who takes care of children on their otherworld journey. The ritual of honouring the foetus or stillborn is called mizuko kuyo. The word mizuko means "water child," or "deceased infant/foetus," and kuyo means "memorial service." In Japan, water is both an acknowledgement of death and an expression of faith in some kind of rebirth. When the foetus or newborn dies, it goes from the warm waters of the womb to its former liquid state, in which it prepares itself for an eventual rebirth. Historically, mizuko were buried beneath the floorboards of houses, where they were thought to mingle with the water of natural springs, which then carried them to larger bodies of water beneath the surface of the earth, which held special significance as receptacles of life. The most common days for mizuko kuyo are during the three traditional holidays when offerings are made to ancestors: bon in the summer, and at the spring and summer equinoxes. The mizuko kuyo can be performed in different ways. Many Buddhist temples in Japan have special sections where a woman who can afford to may buy a tomb for her mizuko. The tomb consists of a stone, on top of which stands a carved figure of a jizo, generally wearing a red bib, and carrying a staff with rings or a stick with bells on top (which he uses to help the mizuko who can't yet walk). On the stone is written a kaimyo - a name given to a person after death. These sites are not somber graveyards. In fact, they are often quite "happy" places. Some of the cemeteries are equipped with playgrounds for children. 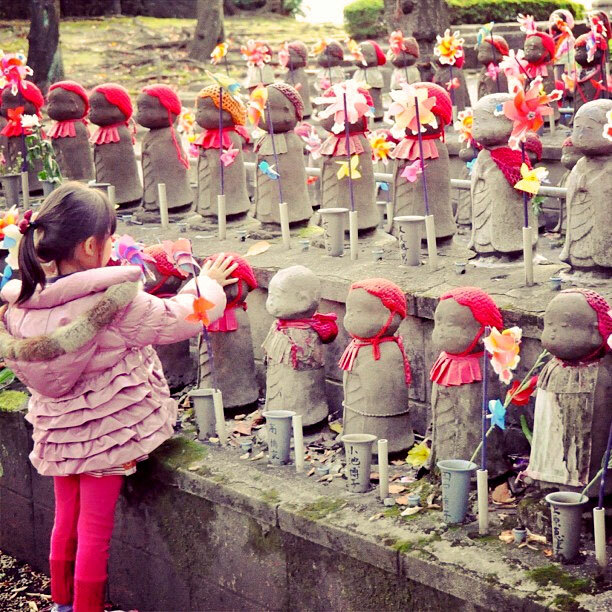 While the children play, women (and sometimes men) bow, observe moments of silence, and ladle water over the mizuko jizo in an act of ritual cleansing. At times they may light a candle or a few sticks of incense, decorate the tombs with flowers, pinwheels and other toys, drape garments over the jizo, and even erect umbrellas over his head to keep off the rain. In Japan, abortion is seen as a necessary sorrow, a painful social necessity, and a means for protecting what are felt to be "family values." Some Buddhists worry that abortions could become trivialized, which would lead to a hardening of people's hearts. The mizuko kuyo serves a positive, therapeutic role, keeping people in touch with their emotions and their loss.